Saturday, September 24th, marked the first day of registration for the Commit to be Fit Challenge, a school-sponsored wellness program funded by the PATH Foundation. The $100,000 grant was written to address a need in the community for an overall focus on general health and wellness. The program plans to offer all residents who register the opportunity to take fitness classes, participate in competitive events, join support groups, design a personal wellness plan with a nutritionist and wellness integration specialist, and earn prizes for points accumulated by making positive lifestyle choices—all FREE of charge, thanks to the grant. Nearly 50 community members signed up on September 24th at the RCHS Fall Festival, a fundraising event to support school classes, clubs, and local vendors. Another opportunity for community members to register will be on October 6th at the high school when Commit to be Fit will be sponsoring a Wellness Day. For community members and staff, the Wellness Day event will take place from 8:00 AM to 12:00 PM with various activities, workshops, and demonstrations taking place throughout the morning. Attend the whole event, or just a portion. The first 150 people who attend will receive a free gift valued at $60.00. An additional opportunity will be available for the parents of our students to join the challenge. The Commit to be Fit booth will be set up at the elementary school for interested parents to learn more and register for the program during the afternoon of parent teacher conference day. This sign up period for our parents takes place October 6th, from 2-4 PM and 5-7 PM at the elementary school. Additional evening registration hours will take place on Monday, October 3rd from 5 PM to 7 PM at Rappahannock County High School. 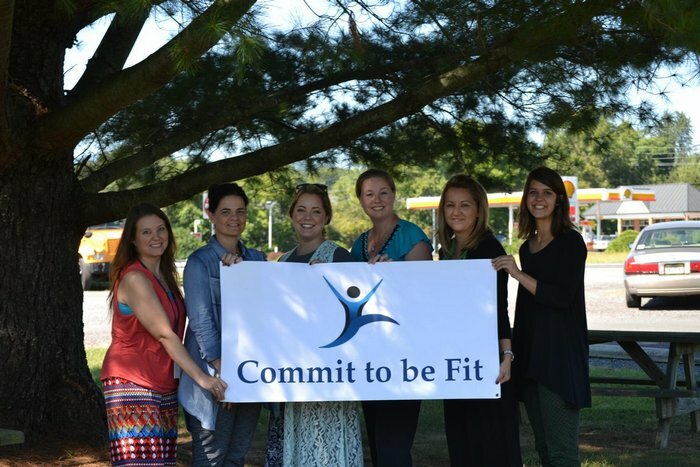 Registration for the Commit to be Fit program will close on October 8th. For questions about Commit to be Fit, please contact Jackie Tederick, Wellness Integration Coordinator, at jtederick@rappahannockschools.us. Visit the School Nutrition page on the rappahannockschools.us website for more information. Picture attached: C2BF Team: Grant Writer/Researcher, Shannon Grimsley; Jackie Tederick, Wellness Integration Coordinator; Jacqueline Lowe-Barton, Wellness Integration Specialist; Holly Jenkins, Wellness Integration Specialist; Stacey Whitt, Director of School Nutrition/Grant Administrator; and Amanda Grove, Nutritionist.